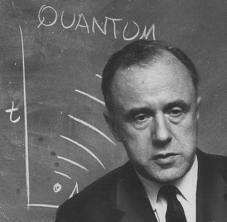 John Archibald Wheeler,1911-2008 (on left), a celebrated professor at Princeton University, worked with Niels Bohr and Albert Einstein, tutored several generations of eminent physicists, had enormous contributions to quantum theory, displayed an astonishingly imaginative spirit, and got famous for having coined some intriguing catchy concepts; among them such as "black hole", and that used in this page's title: It from bit. Wheeler used to utter this maxim without adding any interrogation sign, claiming thereby that the universe does consist of discrete entities as are bits. However, in some other contexts he wondered whether such discreteness of the universe might be reconciled with the undeniable continuity of time. This was like adding the question sign to his maxim. When so completed, his maxim is able to express both the main tenet and the main problem of informational worldview. The tenet runs as follows: information forms the core of reality. The problem is following: whether information processing is always digital (discrete), or must it sometimes be analog (continuous)? Thre is a camp pf eminent scholarsa to firmly defend the digital option. A concise report on digital philosophy is found in wikipedia. This is a point of strong controversy among different orientations within the informational worldview. While Wheeler is a prominent follower of digital orientation, another famous physicist, Freeman Dyson, vigourously defends the necessity of analog information processing. One may regard as unusual that a worldview contains not only assertions but also questions or doubts. However, if we agree that some questions may enjoy a cognitive value as some assertions do, there appears no obstacle that problems be essential parts of a worldview. All this having in mind, we get ready to agree that Wheeler's saying completed with question sign does express the point of informational worldview. Two key concepts occurring above have also a shorter wording - of which we take advantage throughout the blog. These are as follows. However, shortenings happen to have a price to be paid -- loss on clarity. Therefore some comments are in order to restore the clarity we need. Such commenta are found in texts referred to in CAFE ALEPH Table of Contents, item C:2. "Informational worldview" or "informational philosophy"? The word stem "world", as equivalent with "universe" and "reality", directs our attention to the issue we are to have in focus, to wit information and the structure of reality -- to use David Deutch's and Tom Stonier's phrases. The term informatism as the name for a worldview appears with various authors. Its appearance is worth special attention in a dialogue of three scholars, hence titled Trialog. They endorse main claims of informatism, to wit, (1) the objective existence of information, (2) its omnipresence in the universe, and (3) the importance of the problem of causal relations between information and matter. These are issues to be attentively considered in our blog. Does information processing amount to computing? There exist two notions of computing which are by no means equivalent. The broader one: compute = to find somehow the value of a function (italics hint at the lack of more precise demands). The narrower one: compute = to find the value of a function, following certain strict instructions, which we call algorithms. In the latter case the function, its arguments and its value are always rendered with some inscriptions (at a sheet of paper, at a silicon chip, etc). In the analog case, the value of a function amounts to a state of affairs (in nature,mind, or society) which maps another state of affairs (a set of arguments) according to a deterministic law (of nature, of mind, of society). This distiction is critical for distinguishing digital computing and analog computing. The latter is no computing in the narrower sense, just the digital computing satisfies the definition. Nevertheless, analog procedures deserve to ba called computations in the broader sense -- the one which embraces both the domain of analog and the domain od digital. When speaking of information processing as being computational, we refer to the broader concept of computing. Thus the equation as put above constitutes the claim for the acceptance of the broader notion of computing. Those who comply with that claim may be called dualists, as admitting two varieties of computing, while those sticking to the narrower notion -- as the unique to be acknowledged as proper -- deserve to be called monists. Such a monism and such a dualism are both varieties of informational worldview, if only they acknowledge points 1-3 as listed in the previous Section. The worldview hold in this blog is informational-dualistic. It is meant as a starting point for discussion. Obviously, it may change in a discussion, if relevant arguments are given.